For the first time, the Chief has been asked to attend the convocation ceremony at a local high school to present a welcome certificate to a graduating senior who will be attending USMMA in the summer. Maybe he’s been asked before but he’s never been home this time of year (which doesn’t bode well for him being home next May/June for T1’s graduating season). It’s a good thing he has his new khaki uniform and shoulder boards. I thought he looked rather handsome this morning. When I asked if I could take his picture he said “No.” Bummer. The Chief also took it upon himself to find a USMMA challenge coin to present to the future midshipman. T1 actually has a classmate that hopes to be appointed to USMMA next year. I think it would be so cool if the Chief was the one to present to him as well. Keeping my fingers and toes crossed that the Chief will even be home for T1! The Chief was nominated by one of his bosses from the class of ’91, for the Silver Mariner Award for 25 years of sailing. He has been selected to receive the award at the upcoming reunion and Homecoming weekend. Unfortunately, the Chief cannot get relieved to come home and I will be unable to go without him. I am so proud of him for sticking with this crazy life, even with its challenges and pressures. He is my rock and hero. The purpose of the Silver Mariner Award is to recognize those alumni and graduates of the U.S. Merchant Marine Academy and its Cadet Corps who have fulfilled the principal goal of the Academy to prepare mariners for a career at sea in the Merchant Marine or in the Armed Forces of the U.S. Recipients must be licensed and sailed as a Master, Chief Engineer or First Class Pilot. They must have sailed for at least 25 years in an unlimited license capacity with a minimum of one voyage necessary to complete a successful year. Five years of active military duty afloat time may satisfy five years of the Master’s or First Class Pilot’s Award and five years of licensed deck officer time may satisfy five years of the First Class Pilot’s Award. To receive the Military Silver Mariner Award, one must have served on active duty for 25 years in one of the U.S. Armed Services (including NOAA) and achieved the rank of O-6 (Captain/Colonel). Mikey Weinstein was a 3 year old child who walked into the mess hall on Homecoming morning back in 2009. We played Susquehanna that day, a team that would ultimately win the Liberty League conference that year – we beat them 24-8……………We signed up to help provide a positive support group for Mikey and his family. We gave them an opportunity to be a part of the USMMA Family and provide some moments of pleasure. While we were able to do that, it was Mikey and his family who demonstrated what true courage and commitment is all about. None of us can remotely fathom the feeling of frustration and helplessness the Weinstein’s encountered on a daily basis. But they showed us the true meaning of sacrifice and a relentless pursuit of making their lives the best they possibly could. Instead of us making Mikey more comfortable, we were the ones that learned, we were the ones that benefitted more from the relationship. 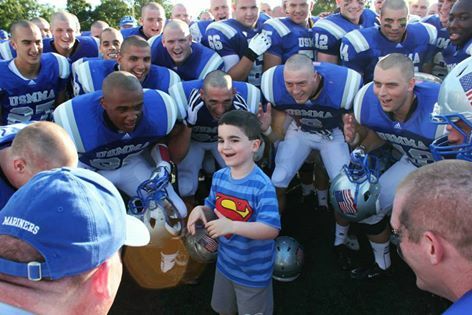 The Weinstein family will forever be as much a part of USMMA Football as any one of us. 2.) What were you blogging about last year at this time? How have things changed? One year ago today… I was writing about the closing of USMMA. I was preparing for and ran in my first 5K at a Making Strides Against Breast Cancer event. I gave my opinion about the Captain Phillips movie. I had a snarky Friday about my overwhelming schedule. And I ended the month writing about being replaced as favorite daughter-in-law. USMMA has reopened and their football season has gone uninterrupted this year. Too bad we lost the Secretary’s Cup game to the Coasties. Oh well. I just ran a 5k today in preparation for this year’s Making Strides. My time was about the same. It was brutal. What today showed me is that even if I am not feeling my best (real achy today) I can still bang out 3.1 miles and not give up. I have to run 5K on Monday and then taper down till the race on the 12th. P.S. If you’d like to sponsor me, send me a message and I’ll tell you which team to make a donation to. I still haven’t seen Captain Phillips but on the flight to Hawai’i the Chief watched it. I preferred to watch Winter’s Tale and another movie I can’t name off the top of my head. My schedule is just as overwhelming and even more so as I am now subbing twice a week if possible. It is taking some adjusting to both personally and as a family. At least we don’t have the added issues of a crazy team mom or a lousy school team experience to compound things. I just hope I can make it to Nov. 15th without a nervous break down. Nov. 15th is my first no-activity weekend since Aug. 30th. I am sleeping in. Sleeping in and having pancakes. So much has changed and yet so much hasn’t. Writing Prompts for Oct. 2nd. 1.) September 29th is National Coffee day. How do you like your cup? 3.) Your most favorite (or lease favorite) fall fashion trends. 4.) Throwback time! Share an old photo and tell us about it. 5.) List your top favorite things about Fall. You are currently browsing the archives for the Maritime Schools category.